are you still eating healthy (or trying to)? YES? (i’m trying but i’ve been out of town the last two weekends). let’s stay on the wagon (or get back on it). this matcha coconut breakfast bowl is perfect for starting your day with, especially if you’re rushing off to your LAST COMPUTER SCIENCE CLASSES OF COLLEGE and then doing some internship things and plotting where to adventure to next. speaking of the internship: i wasn’t looking for any more internships (except disney ones lol), and then this one landed in my lap. someone reached out to me about it, and next thing you know, i’m interning for one of the competitors of the company i interned during summer 2016. so while the function i’m performing for them is what i (think) want to do full-time post-grad, this product isn’t quite as exciting to market as the one i was working on this recent summer. sigh. now, that matcha coconut breakfast bowl. i was on a huge barley kick when i first made this, partially because it’s super cheap when you buy it from the bulk bins at whole foods, but mostly because i love how chewy it is. pair that heartiness with crunchy chia seeds, walnuts and coconut, as well as some juicy nectarines (or whatever you have on hand), and you’re golden. or green. and while this does skew more heavily towards the healthy breakfast category than the decadence of brunch, might i suggest a smidge of sweetened condensed milk on top? you get major milk tea vibes, which i’m not mad about (especially early in the morning). 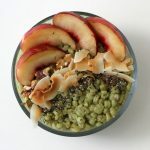 This matcha coconut breakfast bowl features fiber-rich barley to keep you full til lunch, and plenty of matcha, fruit, coconut and nuts to keep things interesting. Bring the barley, coconut milk and 1 cup water to a boil in a medium pot. Turn it down to a simmer and cover. Cook for 30 minutes, or until chewy but not starchy. Keep an eye on it to make sure that it doesn't boil over. If it looks like there's no more water left, add a splash more. Sprinkle the matcha over the barley, and mix until completely combined. Spoon the barley into a bowl, and top with the nectarines, walnuts, coconut and chia seeds. Drizzle with the maple syrup, then eat warm. By no means do you have to stick with these topping ideas! Use whatever fruits are in season, whatever nuts you like, whatever seeds you can tolerate. I know I sliced the nectarines in the picture, but chopped makes much more sense for even distribution with the barley. You can leave out the maple syrup drizzled on the top if you want. You can also use brown sugar or agave to sweeten. And if you're okay with this not being vegan, honey or sweetened condensed milk works well. 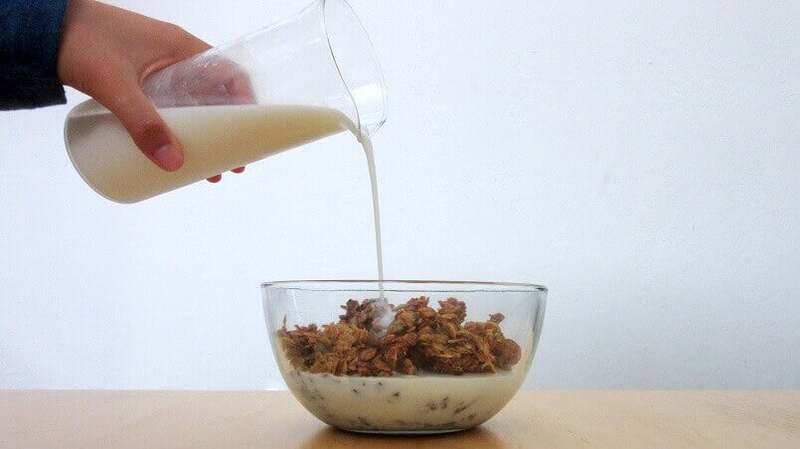 Never thought of using barley for breakfast, cool idea! And of course, I love anything matcha so you’ll bet I’ll be bookmarking this! Is it worth taking an internship that doesn’t excite you? I still haven’t found matcha! i took it because i wanted to learn something new- i’ve never worked with such a small program before, so it’s forcing me to be more agile and test out different things. so maybe not as exciting as my last one, but i’m grateful for the opportunity to gain new experience anyhow! ahh i hope you can find matcha soon though! can you ship it to your house? This looks so good, what a great bowl of food to have for breakfast! Would love to wake up to this. I’m so into the chewy grains, too, Heather. I’ve not cooked with barley for a while though! I love the matcha in this, too! Thanks for the inspiration! yes! so filling and i love something warm in the mornings during these cold months. This is very pretty and sounds very yummy!! Oooh, can’t wait to hear more about the internship! Congrats! I’m so old I still don’t know what in the world matcha is. And you only used 1/4 teaspoon? Is it worth it?!! Is it tea? I’ll go google. Good looking bowl, tho! Hey Mimi, matcha is a very finely ground type of green tea. It is considered to have more health benefits from other tea types, and it also lends a nice green color wherever you use it! i’m sure you’ve found out by now (i’m perpetually behind on comments! ), but in case you haven’t, it’s green tea powder! it’s a different kind of green tea than the kind you normally see in tea bags (so you can’t just grind that up and use it like matcha). you can get it shipped to you pretty easily though (: and i only used 1/4 tsp bc it’s pretty strong and expensive! So much good stuff in this bowl! And anything with nectarines has to be delicious! yes to everything with nectarines (: tbh, i could just eat them plain and be happy lol. This is the kind of bowl that would encourage me to actually eat breakfast. Pearl barley and matcha is a new one for me but it sounds delicious! You make me feel bad!! I didnt even attempt to get on the healthy band wagon this january lol. You’re in such an exciting part of your life!! I hope everything with the new internship goes smoothly. I LOVE the combo of matcha and coconut! This is something totally fun to try for breakfast! So, you’re basically like a double spy, working for the competition, haha! Barley is a favorite ingredient and I’m sure this recipe will make a great breakfast! Such a perfect breakfast bowl! The barley sounds great in this, and I love anything coconut! Oh cool! I’ve never made anything with matcha or barley before so I’m definitely pinning this recipe for later! And congratulations on finishing your last computer science course! That has to be a weight off your shoulders! I love the barley in this! I’m sure it has a nice chewy heartiness! yeah i love the chewiness of barley! mushy grains are a no-no in my book. Talk about a heart breakfast bowl that ISNT OATMEAL! Ha! Finally. Way to think outside of the box Heather and incorporate that healthy AF matcha!! YES. oatmeal gets tiring sometimes, and i’m not a huge fan of the texture (steel cut is better than regular oats, but i’m not like YES GIVE ME ALL THE OATMEAL). I feel so healthy just after looking at this! I haven’t tried barley like this before! But I can see how it works with all the other healthy stuff in this bowl! I love matcha with everything, especially for breakfast as it just gives me a bit of a boast in the mornings. 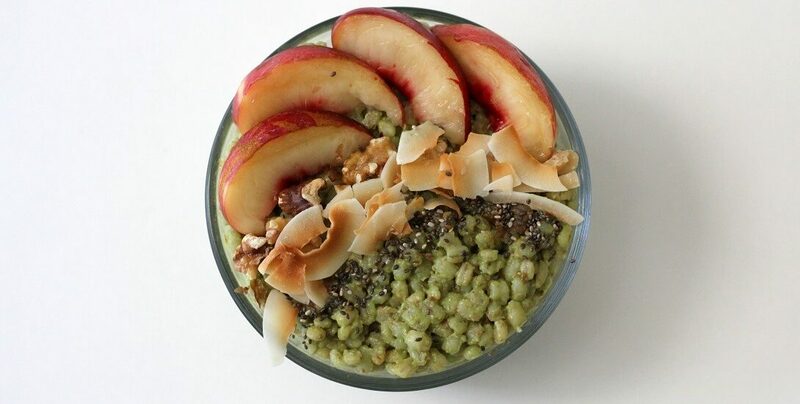 The matcha coconut breakfast bowl sounds all sorts of healthy! Good luck with your last semester~ Congrats on finding an internship! Hope you’ll gain the experience you need to strengthen your skills in the professional field. 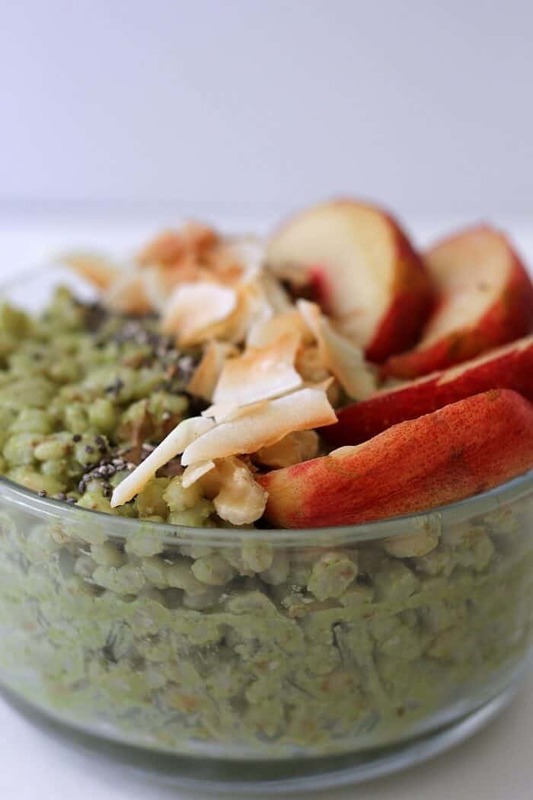 I love matcha and coconut – you just brought in the best of both worlds together INTO A SINGLE BOWL!!! I love how it’s easy to make as well! the internship is definitely making me work for it- i was doing a similar role last summer, but because that company’s team is well established, and this one’s isn’t, it’s a very different experience (; and yes, matcha + coconut is so good! I hope you enjoy the new internship! This is a wonderfully wholesome breakfast! It’s so much healthier than the deviled have toast I’ve been eating. I have never had barley for breakfast, but I should start! Barley for breakie! Sounds great- I am also on a matcha kick these days. haha it seems like a lot of people are on a matcha kick (; it’s everywhere (at least in the pockets of california that i frequent), and i love it! Ooh this really sounds like a good way to start the day! I have a bag of Matcha I hardly ever use so maybe I’ll be giving this a go soon! Also, the photo at the top is gorrrgeous! This sounds absolutely perfect for a healthy hearty breakfast.